I took a day away from my studio in the Torpedo Factory Art Center to wander in Washington DC. In the heart of America’s capital there is a collection of curiosities- of marvels, wonders, accomplishments and inspirations. Some are artistic. Some are historical. Some give us a peek into the future. The Mall itself stretches broadly from the capitol building to the Lincoln Memorial. It’s lined with architectural oddities. The original Smithsonian red castle, quaintly Disney-like, is on the east, brimming with an amazing assortment of significant oddities. The National Gallery, Natural History Museum and the Freer are elegantly formal structures featuring collections that match the exterior, both in art and in the sciences. The East Wing’s bold design soars into the future, as does the Air and Space Museum. 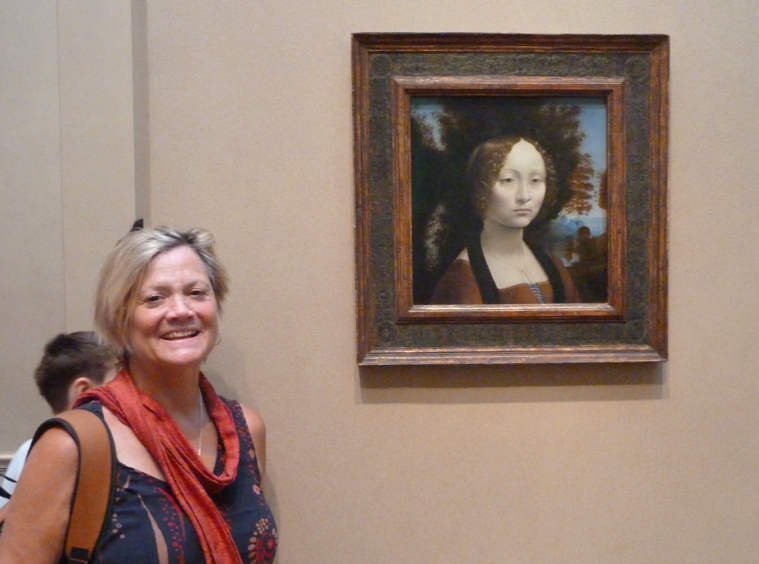 In the National Gallery West Wing visiting with Da Vinci. These buildings and their contents are old friends, near and dear to my heart. For old time’s sake I had a visit with Leonardo while in the National Gallery. 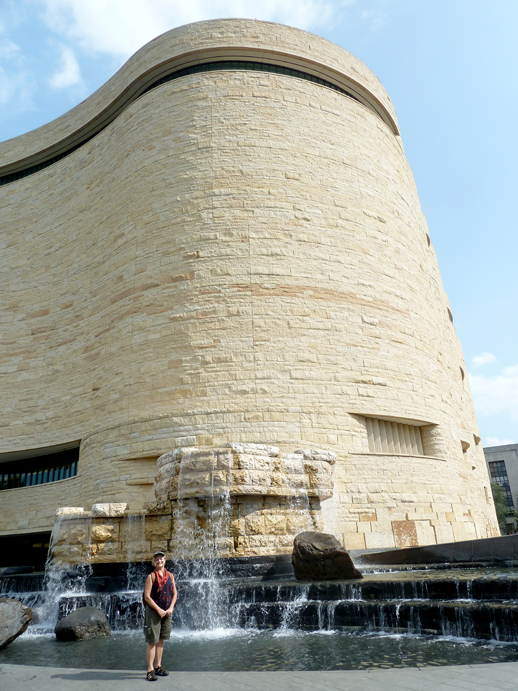 But gloriously new (to me) is National Museum of the American Indian nestled up on the east side, close to the capitol. The warm, rough-stone building welcomes you as you walk across the searing heat of the mall in summer. Surrounded by sacred stones and rushing water, the walls speak of Chaco canyon’s meticulous structures, of Ancestral Puebloan cliff dwellings nestled into canyon walls and even the ancient cities of the Andes: Ollantaytambo and Machu Picchu. The displays are wonderfully done. Particularly the multi-dimensional video/performance on the fourth floor. Not to be missed! Four floors of hallways curve in a gentle maze through exquisitely designed exhibits. Bonus: There are so many interesting foods to try in the cafeteria/dining hall, from cultures spanning the western hemisphere. The gluten free labels were a welcome surprise making the experience much easier for a celiac such as myself. To me, it felt like coming home. THANKS for taking us along on this tour Liza!